Tradicional hedging strategy, and you can set time to start, to do not start again and time to stop (Subject to market). It opens two opposite positions when a new bar appears. Then, waits till both close by SL or TP, then opens the next two. If it's time to do that! When it's time for the "final output", it closes all opened orders, if market is still working. Zero in this parameter disables this feature. - Magic Number - To use for more assets at the same time, use different Magic Numers to each of them. - PIPS for Forex. PONTOS for Brazillian B3. - Lots - Lots in each order. - Buy Only, Sell Only, Buy & Sell - As their names. - TP - Take Profit. 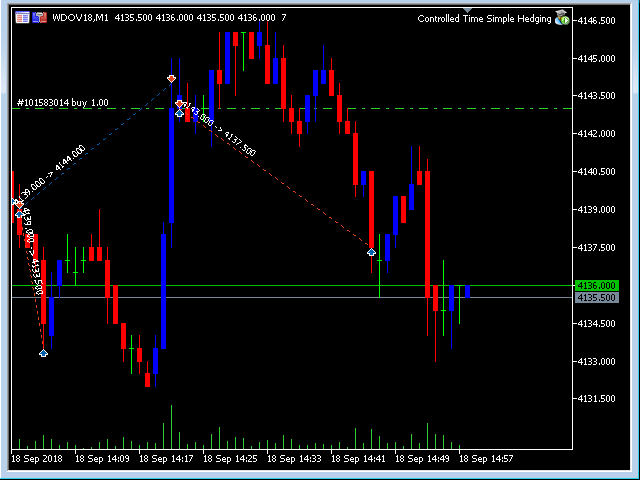 - SL - Stop Loss. - Time Controlled (true or false) - True, it makes schedules respected. False, it operates without time limitation. - Minutes for Final Output - Minutes after the Final Hour and Minute time, to close the orders that were still open (subject to market). Set zero (0) to disable this option. Valores default com PIPs com buy e sell. Opção de apenas comprar, apenas vender ou comprar e vender agora aparecem mais nítidas. Opção de apenas comprar, apenas vender ou comprar e vender.